So I thought it would be a good idea to share the success I have had becoming healthy again. I hope this encourages others to be the healthiest they can be and that it continues to encourage me to do the same. Without making excuses I'll start by saying I allowed myself to get about 30 pounds over weight. I'm pretty sure I still looked just fine, but my clothes didn't fit me, I was always tired and never motivated to do anything. It didn't happen over night. I gained the weight over about two or three years as my activity level and eating habits became poor. Some of this was due to the circumstances going on in my life that required more attention from me than usual and some of it was from sheer laziness. As I approached 44 years old I kept looking in the mirror and knew I could go two ways, I could accept my weight and be the average middle age man or I could rail against the night and be the healthiest I have ever been in my life. I chose the latter! Once I decided I needed to lose the weight and get healthy I knew I would have to make life style changes, not just go on a diet. My lifestyle and job give me many opportunities to eat rich and not so "diet" friendly meals and most importantly good beer. So I knew I would have to allow myself some wiggle room and not let these opportunities stop me from attaining my goals. I knew I had to be in this for the long haul so I picked a new life motto; "slow and steady wins the race". What that meant for me was that I was not going to let little hiccups in my new routines derail my overall success. And, as contradictory as this sounds, I was not going to set time limits on my goals. My first goal was to lose 20 lbs. It began in August of 2012. This is a bad month for me to start dieting because I had two big eating events in my near future, Momentum and Shareathon. Momentum is a radio conference held at a Disney resort at the beginning of September and Shareathon is our weekly fund raiser at the end of September. I knew that during these weeks it would be hard to maintain a 'diet'. So I started by learning how and what I ate in a normal day. Being the geek that I am I decided to see if there was an app for that and sure enough there was. And it was FREE! I downloaded Lose It, which is an app to track choleric intake. It allowed me to enter my current weight and how much I wanted to lose. Then it told me how many calories I was allowed to eat each day. All I had to do was input what I ate into the app and let it do it's thing. It has a pretty comprehensive data base of foods including fast food and pre packaged foods. It even lets you snap a pic of the barcode on most food items and it looks them up for you. It made it really easy to see how much I was eating. I noticed that as I was logging everything I ate I would look at the nutritional value a little more critically before deciding what to eat. For the long haul this allowed me to make better eating choices. It also helped me repair my distorted view of what a full meal looked like. So when I did not have healthy choices in front of me I was able to eat smaller portions and not feel like I was missing out. Then next thing on the agenda of good health was to start exercising. The Lose It app would allow me to enter the exercise I did each day. When I logged in my exercise I got those calories back in my bank for use later in the day so I could stay on track. My bicycle had been stolen when I moved into my new place the year before so biking was out of the equation. I also hate running, especially in the florida heat. So I knew I would have to find something quick and easy that I would not mind doing frequently. I knew it would not do me any good unless I exercised at least three times a week. I also wanted to make sure I could do it while I was on the road so I looked for something I could do in my bedroom or a hotel room. I found this workout at nerdfitness.com. I used the level one workout which only took 25 minutes a day. Thats 5 minutes of warm up and then 20 minutes of the circuit without any rest. I honestly felt pretty ridiculous the first few weeks of doing this in my bedroom but I figured nobody can see me so it didn't matter. I learned that working out this way burned more calories and the burn lasted much longer than I anticipated. I did this two to three times a week before my shower in the morning. It was not long before I was able to see results of the exercise and watching what I ate. But my motto was "slow and steady win the race" so I didn't let any quick gains, or losses in this case, go to my head. The first five pounds are always the easiest to lose and subsequently the easiest to gain back. I found that setting an overall goal with no time frame on it was just what I needed at this point in my life. I didn't avoid treating myself when I felt it was appropriate and I didn't beat myself up when I was not always on the straight and narrow path to good health and nutrition. I really felt balanced through the whole process of getting back into shape. 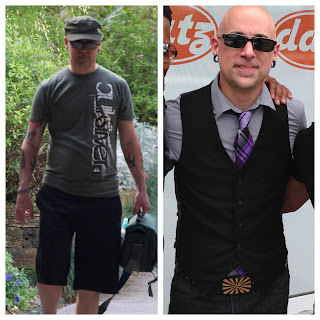 Within about 8 months I got rid of the 20 pounds I was hoping to shed. I went from 180 to 160! I never said I "lost" weight because that implied I would possibly find it again. Nope I SHED those pounds! I was down from a size 36 waist and back into my 34's. My medium t-shirts fit without showing so much bagel in the middle anymore and I felt good. Now that I was confident in my results and new lifestyle it was time for a new goal. I wanted to get rid of the last little bit of belly fat I had and shed 5 more pounds. I knew that the home workouts I was doing were good for me but I was going to have to step it up a notch if I wanted to make any more progress. It was time to go back to my old friend the gym. I have been a gym rat many times in my life. In my early teens I built a weight training gym in my garage. It didn't get used much but it was a start. Then in my late teens and early 20's I had time to really get into it and joined a 24 hour gym. I was pumping iron every dang day and loved it. Then kids came into the picture and I had to drop it. I started skating with my brother a few times a week at SPOT to stay in shape. No muscle but no flab either. Most recently it was the rock wall gym Vertical Ventures, where they kids and I played a few times a week while I was a youth minister, until Maddy's health stopped her from being able to climb. When that happened I felt like a traitor if I went to the rock wall gym without her. A little more history, the reason I was rock climbing instead of pumping weights the traditional way was because of an arthritic spur I have in my neck that pinches a nerve in my left arm. Any time I tried to weight train from about 1997 on it would worsen that arthritis and make my life miserable. Rock climbing was very easy on my injury and worked much like yoga, in that I could gain strength without having to strain that sensitive part of my body. I give you this history because I was surprised at what happened next. As summer approached I had a shift in work schedule, I was filling in on the morning show, I joined a new gym that just opened up in my neighborhood, Crunch. It is only $10 a month and it was brand new and very clean with every modern amenity you could want in a gym. My goal was just to have a place I could do cardio away from the blazing Florida heat so I could get rid of that last five pounds. I started my day at 4:30 AM so I decided to push myself and went to the gym right after work at 3PM every day. I started with the stationary bike for 30 minutes three or four times a week along with an abdominal work out. Then I bumped up to an additional 30 minutes on an elliptical machine every other time. Eventually I was in the gym five to six days a week doing an hour of cardio with 20 minutes of abdominal work in between. The results were quick and exciting. I was starting to think that I would be able to have a six pack again just as I turned 45! It was not long before I heard the weights calling my name. I though I would give it a try and see what happened with my neck. I began with very light weights and lots of reps. Just building my strength and making sure I didn't put too much pressure on my neck and spine. I had already been doing pull ups and push ups at home so it was pretty easy to start a full body work out with free weights and some machines interspersed. I was happy to find that I could work out without injuring my neck. Now I am back on the body building band wagon and loving every minute of it. It's been a little over a year since I started my quest to be healthy again and I feel I am in the best shape of my life. I am down to a 31 inch waist. That last 5 pounds I wanted to shed turned into 10. I now weigh 150 pounds for a total loss of 30 pounds! I hope to put at least five of that back on in muscle over the next few months. My chest and back are getting bigger and my waist is continuing to get smaller. I have that wonderful V shape again! I am at about 11-13% body fat. I don't have the biggest biceps in the world but I always have slim muscles anyway. However I can actually see my muscles and my arms are starting to fill my shirt sleeves. I am still a little bit away from having six pack abs again but all in good time. I know it will be a useless endeavor to get my abs to show during the holiday eating so I am concentrating on building more muscle for November and December. So far so good! In January I will make one final push to lose another 3 to 5% of my body fat so the abs I have built up will show through. I know there is a six pack under there I just have to get it visible! For the big picture I believe I am on track to stay at a healthy weight and lifestyle for many years to come! And now for the pictures. On the left is me in March of 2012, on the right June 2013.